These lino prints are printed on our kitchen table with a homemade press. We like them because they are simple and powerful - but don't expect perfection. (They are made by a beekeeper, after all!) Some areas may be less well printed than others and there are odd small messy bits - but we think that just adds to the appeal. Of course, if you don't like your print then send it back for a full refund (not counting postage). I'm using water-based inks on very delicate Japanese rice paper. They are rolled up and posted in a cardboard tube. 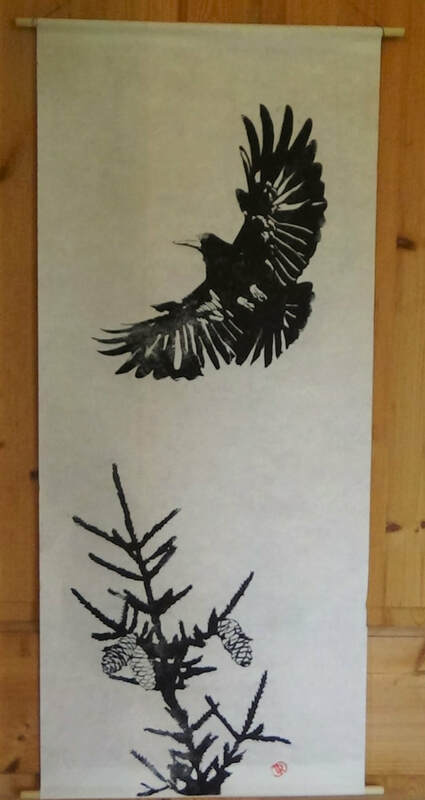 'Rook with Spruce twig' monoprint (black). 15" x 35" (38cm x 89") - it's big! €50.00 - includes shipping anywhere! Some of these are green-and-black, while some of them are blue-and-black. The rook, hare and salmon are all significant in Irish folktales and mythology - I drew them because I like them, but also to represent Earth, Air and Water.